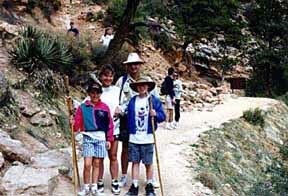 Hiking in the Grand Canyon is allowed year round . We strongly recommend the Grand Canyon Hiking Information Pack, for all the hiking information you will need to have to plan your backcountry trip. Packets contain information on permit fees, permit application procedures, how to apply, when to apply, shuttles, pets, group size, trail lengths, trail descriptions, private livestock use, temperatures, suggested itineraries, a permit application form, and lots of other helpful hiking tips. Havasupi Indian Reservation hiking and camping information. Order your Hiking Information pack on-line here . 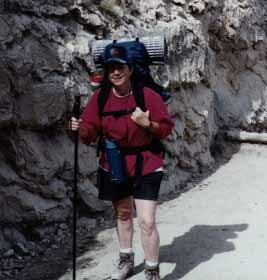 Permits are required for all overnight hiking and camping below the rim in Grand Canyon. Permits must be obtained prior to you entering the canyon from the Back Country Office, and should be obtained as far in advance as possible because of the limited numbers of permits. Permits are issued on a first come / first serve basis. Notice : You can not receive your permits from this office , only the permit application forms and information on how to obtain your permits only. You will be notified by the Back Country Office if your permit request is available or not, (do not assume) . Permits may not be required for day hiking, all though it is strongly recommend you go on a professionally guided hike to get the best experience possible from your hike, for free information on guided hikes see Grand Canyon Trail Guides.